Good morning. I would like to ask you, what do you like best and what gives you most satisfaction, music or chocolate? Who said chocolate…? Nobody? Well then, how do you enjoy music? What a silly question! You listen to it, of course. Everybody knows that. But then, how do you enjoy chocolate? More silly questions, you EAT it of course. Let me read something for you from a small booklet that I got when I bought some fine chocolate. The title is promising; “The art of tasting chocolate”. Anyway, this is what the little book says about how to (not eat but) taste chocolate. Hm, that sounds just like a preparation for meditation. 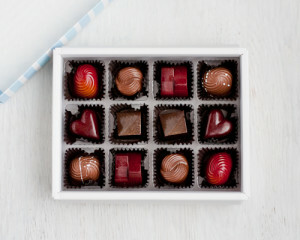 Further, not only you but also the chocolate should be prepared for the experience. It takes two to tango. Then what? Nothing! Place the chocolate in your mouth and do nothing. Don´t chew it. Then, finally, “chew five to ten times to reduce the chocolate to little morsels”. I think my young audience realized that while we listen to music just one sense is involved (hearing), but almost all the senses are involved when we taste chocolate. Eating chocolate is a simpler affair, just involving your mouth, taste buds and nose (since so much of “taste” is actually smell). All this throws light on the difference between eating and tasting. And also on the rather primitive approach we have to music tasting, if such a thing exists. Well of course it exists, but not as a known idea or concept. We DO taste music, for example when we go to a record store and sample different tracks from a new CD to decide whether we want to buy it. But that is a mainly utilitarian kind of tasting, with a precise goal; decide to buy or not. When we take the CD home, are we still tasting it? Yes, maybe the first couple of times. But we might just as well use it as background music right away, degrading it to a soundtrack with a simple, commonplace goal: to create a feel-good mood. We make mood-music of many a piece that was never meant to be furniture music. Talking about richness of experience I of course don´t want to claim that listening to a piece of chocolate breaking is comparable to a Chopin Nocturne. But let´s stop right there! I used the words “listening” and “hearing” without thinking about it. There we have those different quantities and qualities again. Unfortunately we very often hear music without actually listening to it. We hear it, yes, but without those mindfulness-like qualities that manifest when we taste chocolate, wine, cheese and perhaps food in general. If a small piece of chocolate can give you a rich experience for all your senses, imagine what pleasurable heights we might reach if we applied the same kind of carefulness and mindfulness to tasting music! Yes, you say, but all this is really quite logical. A physical thing like chocolate, a sandwich or even a pencil, we can touch, taste, smell or break. But how do you chew or break music? You cannot take it into your mouth, you cannot see it, you can only listen to it. Let us not be so limited. Why did we get our inner senses if not to see, taste, touch or smell music? How can a melody be “sweet” or a sound “fat”? Look at this list of common expressions and tell me that we don´t see, taste, touch or smell music. The list could go on and on. If we look around we can find many examples of the senses overlapping. There is no need to talk of synesthesia, or one could say that we all have it to some degree.